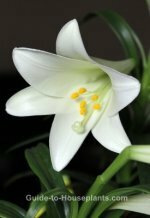 Most common house plants we know and grow are popular for two basic reasons. One, they're attractive, and two, they're easy to grow. Fortunately, common house plants provide us with a huge range of sizes, shapes, and textures to choose from. But why choose? Tall or trailing...broad leaves or feathery fronds...the contrasts look spectacular when brought together in a room. Fiddle Leaf Fig makes a big statement in any room. Interior decorators are finally appreciating this tall beauty as an architectural feature. We're seeing this fig tree everywhere -- online and off. Boston Fern is a classic. 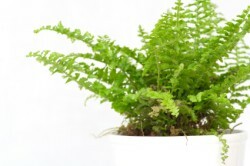 This is the most popular of the fern species that originated in Central America and became a fast favorite in parlors and porches in North America during the Victorian era. Today, there are numerous new cultivars that are getting attention, including 'Fluffy Ruffles' with curly fronds and a dwarf variety 'Timii' that makes an elegant table accent. 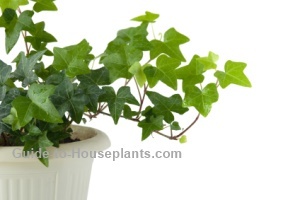 Cascading stems covered with lush lobed leaves make English Ivy an ever-popular houseplant. 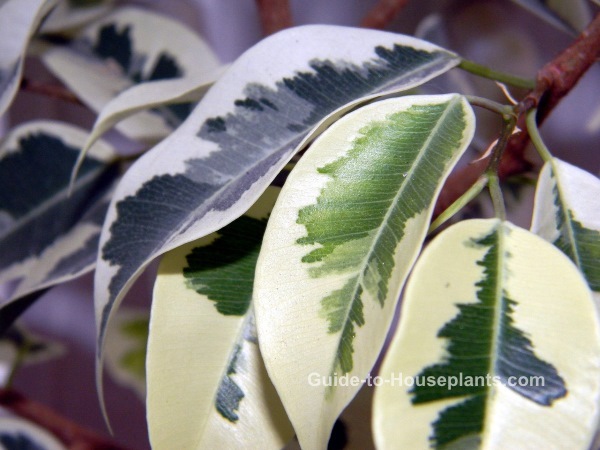 New cultivars offer foliage variegated with creamy white or yellow, giving them fresh allure. Whether you display your ivy on a pedestal by itself, surround it with other plants, or add it to a dish garden, its beautiful foliage is a stand-out. Splashed with cream, green and gray, this Rubber Plant cultivar is stunning. Like other members of the ficus family, this big-leafed tree wants bright, indirect light. It's not as fussy as some about watering, but don't allow it to dry out or it will protest by dropping its leaves. 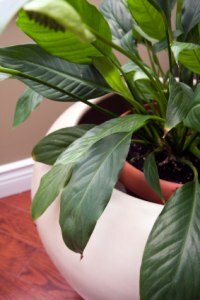 The glossy, deeply-veined leaves of the Peace Lily (shown at right) make it a beautiful foliage plant year-round. It tolerates low light levels. But, give it bright light, and it will dependably produce long-lasting white spathes, each surrounding a spadix covered densely with its tiny, true flowers. There are many hybrids to choose from. 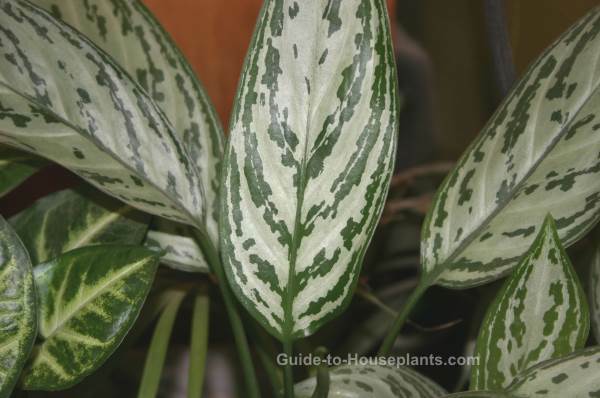 'Domino' has beautiful marbled leaves. 'Mauna Loa' is a popular variety, treasured for its big, showy leaves and blooms. Whether you call it Mother-in-Law's Tongue or Snake Plant, those common names don't give sansevieria the respect it deserves. It's tall, sword-shaped leaves make stunning vertical accents among a group of leafy, bushy plants. 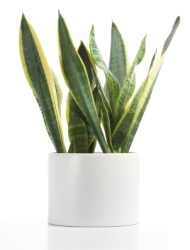 And because of its ability to tolerate low light levels and low humidity, sansevieria is an extremely adaptable houseplant. This hardy succulent originated in Africa and remains a favorite all over the world. You'll find it in homes, shopping malls and offices everywhere. 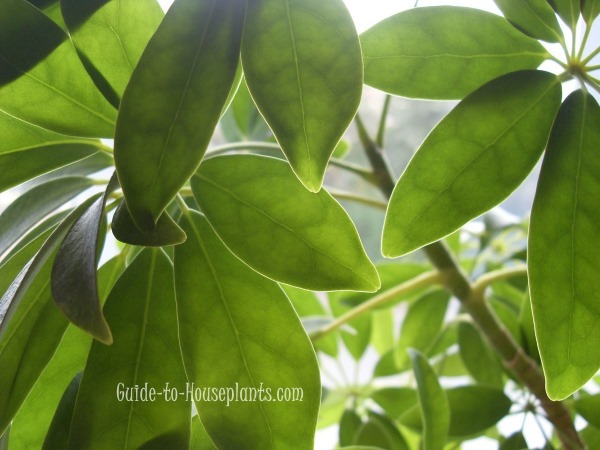 Umbrella-like foliage gives Schefflera the common name umbrella tree. It's easy-care and lush leaves make it a stand-out for indoor gardens. It's more tolerant of low humidity than most tropicals. Give it a quarter-turn in front of the window every week to expose all sides to indirect sunlight. 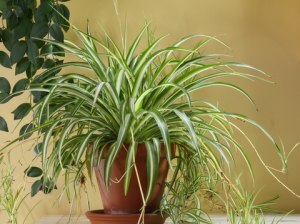 Spider Plant has slender, arching leaves with creamy white and green stripes. It has a trailing habit, making it ideal for a hanging basket. Its spidery appearance comes from the small plantlets that grow on the ends of narrow, wiry stems, called runners. These plantlets -- or "babies" -- are easily propagated, making this a plant that keeps on giving. 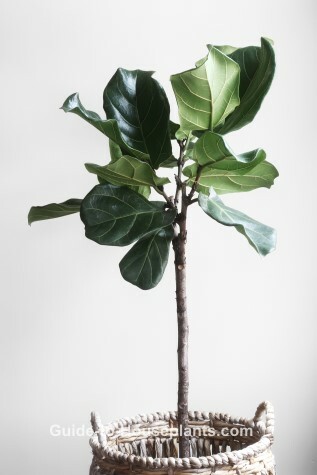 Several common house plants called ficus come from the Moraceae family. 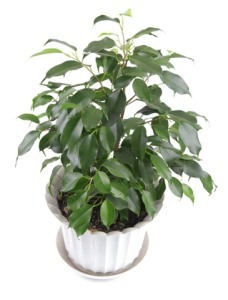 The elegant Weeping Fig is the most popular of all the ficus species from this clan. Although slow-growers, you can expect the tree to reach up to 10 ft (3 m). Dwarf cultivars will grow to only 3 ft (90 cm) tall. Weeping figs adapt best when placed in bright, indirect light and left there. It is known to drop its leaves when moved around. However, with good care it will grow new leaves in spring and summer. Small, waxy leaves densely cover its drooping branches, giving it graceful elegance. Growers sometimes braid its trunks, adding to its charm. Chinese Evergreen is ever-popular. 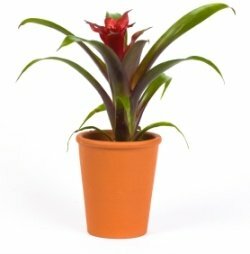 You have a wealth of varieties of these common house plants to choose from, in many colors and patterns. Give them bright, indirect light to maintain their color and variegation. Who hasn't grown a Heartleaf Philodendon? This happy-go-lucky vine tolerates low light and infrequent waterings like few others can. Even with little attention, it grows like nobody's business. Cut it back once in a while to keep it under control. Or put it on a shelf or in a hanging basket and allow the thickly leafed vines to trail. 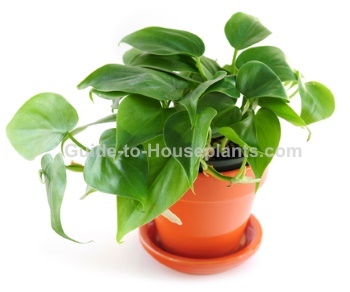 This little philodendron thrives under fluorescent lights, making it a popular office plant.